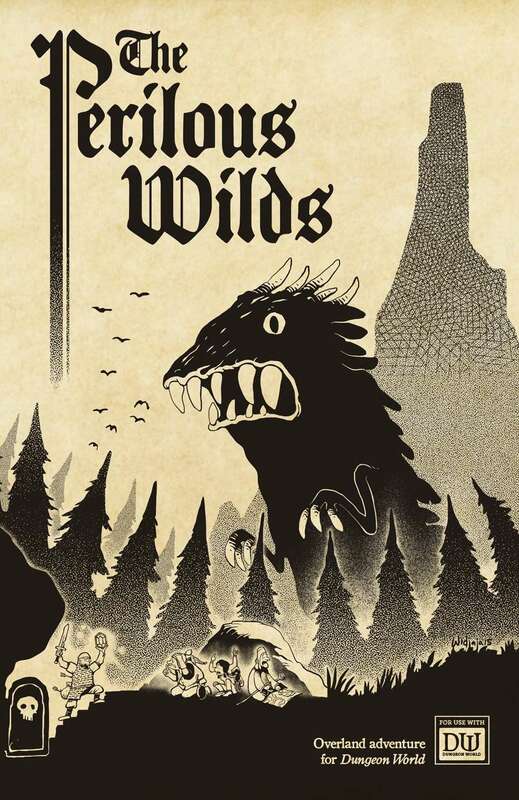 The Perilous Wilds combines Dungeon World's approach to collaborative world-building with the old-school RPG reliance on random tables to generate content on the fly, woven together by modifications to the original Dungeon World travel moves. The main differences between the use of tables in The Perilous Wilds and their use in older RPGs is an emphasis on exploration and discovery over combat encounters, and the baked-in methodology of using randomized results as prompts rather than facts, to be interpreted during play. The collaborative map-making guidelines and all of the tables are system-neutral (usable with any RPG rules). Although the tables are structured to tie directly into the rewritten travel moves, they can be used in any game in which a fantastical landscape is explored. The new follower rules are written by Jeremy Strandberg, and are intended to give NPC hirelings more substance without a significant increase in bookkeeping. I would love to see a book like this in other genres - Sci-fi, Gamma World-style post-apocalyptic, 1920's Cthulhu, modern day zombies. This is seriously one of my favorite gaming books ever (it's always with me in my gaming bag). And I'd love to have one for any game. Any chance of a print version (similar to the kickstarter)? Are there any suggestions on how I'd convert hirelings into followers? A lot of playbooks have moves that grant them hirelings with several points spread out among different skills. How would I change those moves to work with followers? Servants of The Cinder Queen has become my go-to introduction to Dungeon World for new players, yet Lampblack & Brimstone have topped themselves with The Perilous Wilds. Remember that time you first cracked open the 1st Edition Advanced D&D Dungeoneer or Wilderness Survival Guide? You'll get the same magic out of The Perilous Wilds... So, so good. does this require or recommend DW? I am hoping its stand alone. I'd like to know the answer to this also. It definitely requires Dungeon World. However, the creator has also made their own retro-inspired mini-hack of DW called Freebooters on the Frontier, that I actually prefer over Dungeon World. It goes along splendidly with this product. I'd like to expand on this. The worldbuilding part of the book (which is fantastic for making a sandboxy setting, with player input, in an organic way that allows even the DM to feel a sense of adventure during roleplay) is in the "Draw the Map" section, which is 8 pages of pure mostly-systemless gold - other than the use of "tags" (which I consider systemless). "Lead the Way" has alternate DW rules for recruiting hirelings. Since most of it is generating roleplaying elements (motivations, instincts, etc.) it's still useful in other systems, but not truly systemless. "See the World" has alternate DW rules for undertaking perilous journeys. It has a lot of new moves for an expedition, but even here there are a lot of useful pieces for any game (how wild animals react to expeditions, food and water, getting lost). "Weather the Storm"alternate DW weather rules. "Live to Tell the Tale" has new DW compendium...See more classes. This is pure DW. "Ask the Fates" has a discussion of how to interpret random results in order to enhance and expand on DM narration and storybuilding. There is a quick random method to create DW monsters included. Systemless random tables include: random treasure, terrain features, settlements, dangers, details (could be applied to just about anything), and NPCs (no stats). "Plumb the Depths" discusses dungeon design, including random elements. There is a DW-centric section on "dungeon moves" (2 pages) but the vast majority of this section is random dungeon dressing/design tables and advice. "Name Every Person" contains random tables to allow quick naming. For a Dungeon World book, it is extremely applicable to other games. I've been using it for D&D 5E ever since the playtest came out. Any chance for a POD version ? Full size preview doesn't seem to load. Hi David -- I'm trying to resolve this with DTRPG right now. Not sure why it's not working. DTRPG technical support came through -- the full-size preview is working now.